We’re past the shortest day and winter has set in with strong cold winds and grey skies. Only two riders appeared at Rippleside for the start of a short circuit on a few of our norther paths. Karen had been foiled by an incident which closed North Shore level crossing. Richard and Helen (ride leader) set off north around the waterfront to the School Road path near GGS. This leads to the Ted Wilson Trail. Along the trail ride numbers increased by 50% when Lynton (somewhat sleep deprived) joined the ride. The route followed Ted Wilson Trail to Church Street. It was then a quick wind-assisted descent to coffee at Soft Cafe in Minerva Road. The cafe was warm, coffee good, and conversation flowed. It was difficult to get back into the cold and onto bikes for the ride home. At this point riders went their separate ways, with only Helen completing the circuit along the Cementworks Railway path to Douro Street (via a stop-off to visit Coralie in rehab. at Grace McKellar) and then back to Rippleside Park via the Margaret Street overpass. By this time the skies were stormy and the wind gale-force. However, this was a most enjoyable ride – short enough and easy enough that it can easily be accomplished by most riders. 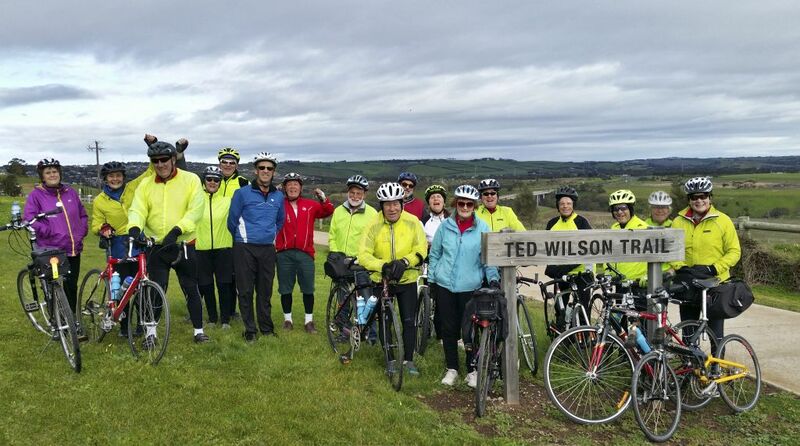 Next week’s ride is the annual Ted Wilson Memorial Ride, led by Maree Burn. We look forward to seeing you there! This entry was posted in Ride reports and tagged Old Cement Works Rail Trail, Soft Cafe Minerva Road, Ted Wilson Trail by hlyth2013. Bookmark the permalink.